On Dec 24, 2013, at 7:52 PM, "Jette McGregor"
Disclaimer: some of the sites posted maybe narconon sites. Jette McGregor has a google plus site https://plus.google.com/110859909857180137836/posts and she recommends Texas drug rehab http://texas-drug-rehabs.org/ apparently ran by the PITA group. If you select PITA Group Inc. in the menu http://texas-drug-rehabs.org/pitagroup.php. PITA Group has been in the alcohol and drug rehab field, at some level, as long as there as been a AOD rehab field and we have witnessed a time when there was only one drunk helping another, (AA), to a time when the medical community has determined that addiction is a brain disease and that there will be medications that will return addicts to their normal functioning. Our most exciting new venture is in the realm of Fibroblast Growth Factor (FGF) with results that are are literally overwhelming. It has been a tremendous boost for people staying clean, but even more important it has added to the repair of those physical factors that are damaged through drug abuse, such as lungs and liver. PITA Group has had the advantage of helping people get off of drugs without using other drugs. We have been part of a nutraceutical company designed to get children off of Ritalin using amino acids and other natural supplements. Not only can they help you with a rehab center (not) but they can set you up in a business. PS: Sunshine, You may want to edit that and use quote marks for identifying who is stating that because it looks to the average reader kind of like you are making the claims personally ( although I know you aren't). This lady works for Narconon Arrowhead. Use google to search the key words "gary smith certifications". You will see how "certified" they are. Jette is married to the man that made this fraud possible. Its not even her picture in the link. Wonder how long that will last there? Joe and Claire Pinelli still at it as well. Their site was off line for a while and now its back up. These two are zealots. Here's their links page, which consists of links to International Academy of Detox Specialists, NY Detox Project, Narconon, Second Chance Program, Utah Project, and Clear Body, Clear Mind. P.S. off topic: While finding the links above, I also found some scientological nests of sauna detoxes using Clear Body, Clear Mind as their model, but they're not Narconons. I wonder where I should post about them. I received sad news that Narconon Arrowhead staff member Jette McGregor, Kent MGregor's wife, passed away on October 29,2014. Jette was apparently only 59 years old. There are not many details being made public about her passing away. It's been mentioned, but not confirmed, that she died of lung cancer. It appears she died in the USA. They live in McAlester, OK, near Narconon Arrowhead. She is originally from Denmark. 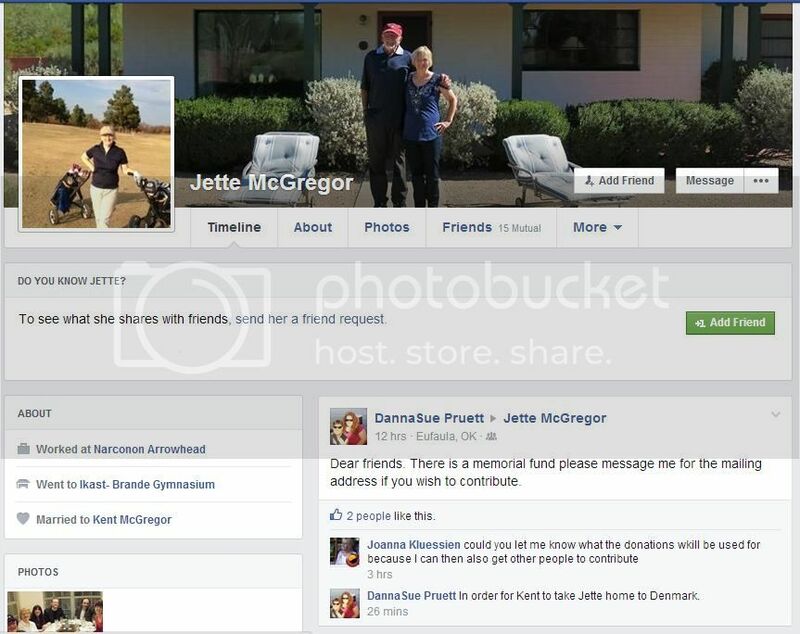 A fund raiser appears to have been set up to help Kent bring Jette home to Denmark to be buried. I received a screenshot of a mention about this from co-worker DannaSue Pruett on Jette's Facebook timeline, which is not accessable to the public to see. This must be a difficult time for her loved ones, especially Kent. I can't imagine the pain this has caused him. They were married for many years. I don't know how long she was with Narconon but I know it's been quite some years. The beginning of the end of my relationship with Narconon started with Jette McGregor. Despite how she treated me and many other staff at Arrowhead I am not going to stoop to the level that they would have if I had died saying,"he pulled it in when he messed with LRH, NN and Arrowhead". Instead I offer my most sincere condolences to Kent and the other staff at Arrowhead who lost a dear friend and ally. I dont hold any grudges to anyone caught up in the Narconon fiasco and hope that some positive reforms come out of what is being done. Its been hard as hell on me personally to deal with this and know that could be me in the obituaries. I pray to God that it ends for all of us in a peaceful and healthy manner and no once else needlessly dies. The lives of many people in need of help are at stake. Kent if you are reading this please know that I feel for you in the loss you have suffered and hope that you can find peace and happiness once again. Thank you for that, Eric. The beginning of the end of my relationship with Narconon started with Jette McGregor. Despite how she treated me and many other staff at Arrowhead I am not going to stoop to the level that they would have if I had died saying,"he pulled it in when he messed with LRH, NN and Arrowhead". I hear ya bro.Hard to find a middle road considering some of the players involved. Good for you, Eric. Nicely said.